Extract every publicly available information from a list of Youtube Channels. Do you want to do some stats from a large number of Channels? This tool will extract every public information from a YouTube channel for you and neatly arrange it in a single spreadsheet. Spreadsheet URL: The link of a Google Spreadsheet (or CSV) with Youtube Channel URLs in it. Your spreadsheet should contain a list of Youtube Channel URLs (one link per row). You can also enter a single Youtube Channel URL directly in the field. Now that your API is ready, you can customize it to make it work repetitively. 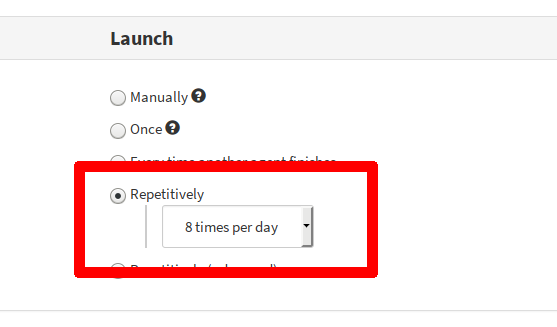 To do so, simply hit the “Settings” button to define when your API is launched. Now that this is set, click 💾 Save at the bottom of the page. There you go, the scraping will be made for you without you doing anything!